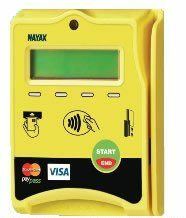 Options Management works with leading cashless machine manufacturers including Nayax to guarantee supply of the latest cashless vending systems. Most vending suppliers tell you that their systems work with all cashless systems, which is not always true. This is because the options they provide are limited in the data or use of the facility. At Options Management, we discuss your objectives and can advise on whether the system will be compatible with cashless suppliers or whether you need to upgrade your machines. We work with countless cashless suppliers or with your nominated provider to ensure a smooth installation. Being at the forefront of our industry, we now offer a standalone card reader that can take cash and/or any credit/debit card, be it for a 20p cup of coffee or a £20 transaction - all simply at the wave of your card. The days have gone where a machine just isn’t giving change or you haven’t got the right change in your pocket. Cashless vending offers the same experience as a coffee or sweet shop. We offer a simple key/card-and-coin system on your drink or snack machine, which you can charge up with credit. Alternatively, we can offer a number of free drinks on daily allowance. Options Management specialises in working with schools, academies, and universities where biometric systems and door access is being installed. This allows us to work closely with the market leaders in this field. Let us work with you and your cashless provider to guarantee a smooth installation or contact us when you are looking to develop a new project. Contact us to learn more about cashless vending solutions and systems.